This is what I wore for Halloween two years ago! 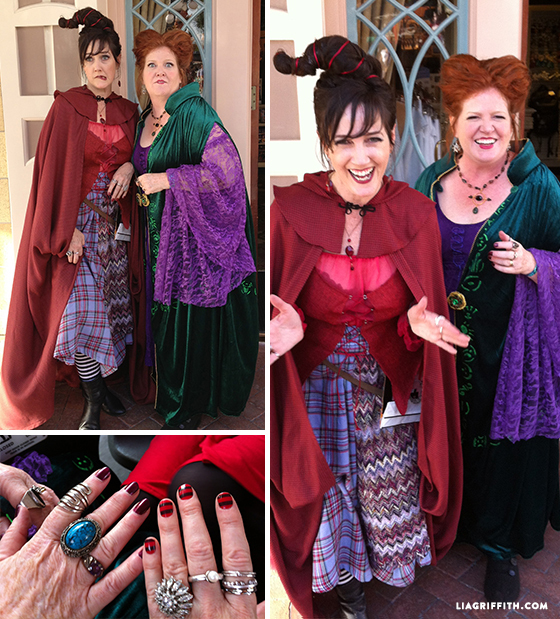 Yes, my sister Deanna and I took on the characters of Winnie and Mary Sanderson and created these Hocus Pocus costumes for the annual Micky’s Halloween Party at Disneyland. Dress up like a Disney character to go to Disneyland? Absolutely! And we were in good company with all kinds of characters at this jam-packed event. In our parking lot shadow, you can see our teen and adult kids dressed in their costumes too. 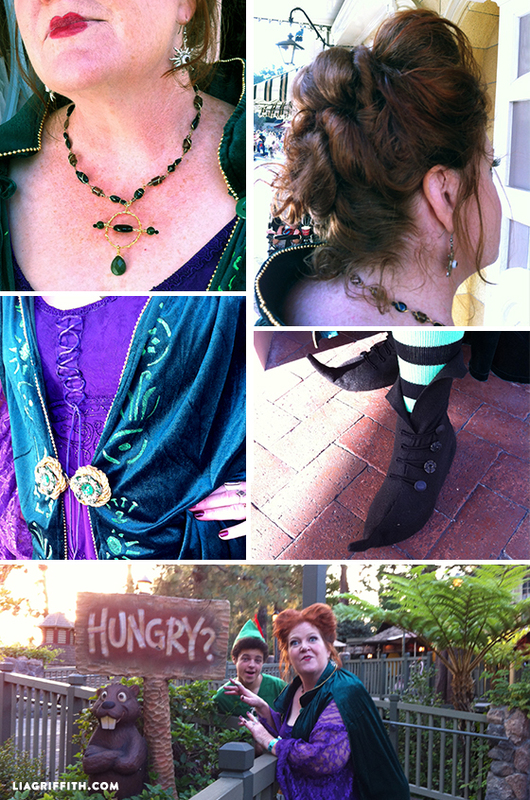 For our Hocus Pocus costumes, we studied the details of the movie characters very carefully. 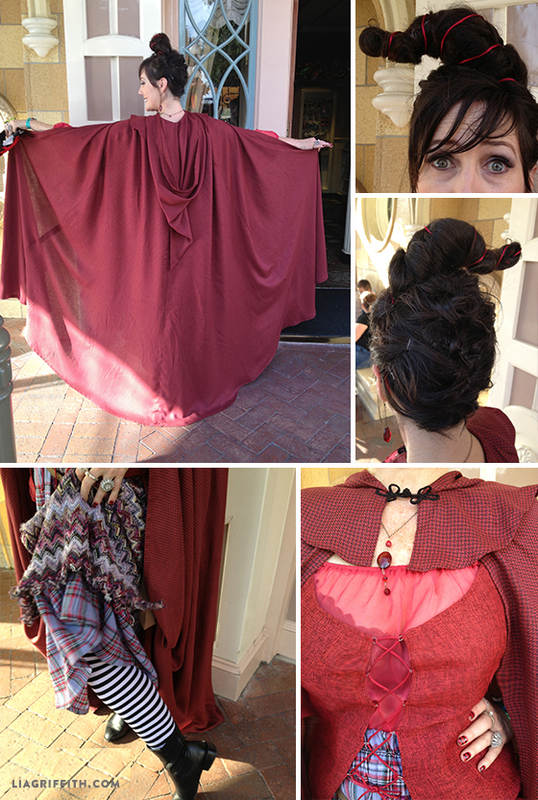 We each gathered the pieces, altered what we needed, and I made my blouse, vest, skirt, apron and cape. I made the statement necklace for my sister using stones I had in my jewelry making box and we shared rings, earrings, and other baubles to finish our costumes. Preparing the hair was a hoot! I purchased a long strip of weave hair at Sally’s beauty supplies in red and dark brown. I then arranged my top piece around heavy wire and attached it onto a headband. The day of the event I arranged my hair up and over the headband, mixing my real hair into the piece. My hair is not terribly long but I made it work. For Winnie’s hair, I made two balls from pillow fill and a brown pantyhose piece, then sewed them onto her headband. I attached the fake hair at the base of the filled balls and on the day of the event covered them with both the fake hair and her natural red hair. Since I had a lot of leftover hair in the back I was able to make a beautiful twisted bun. Quelle idée superbe! très beaux costumes et si amusants!! This make me smile!! very fine ideas!! Thankyou for this moments, I am like a child when I see this movie!! Bon Halloween ! The costumes are just amazing!! The details are incredible. I’m still smiling. You are one talented lady!!! I love everything but am totally fascinated by your hair. That’s clever and I’d be repeating that costume every year. Thanks for the fun blog. You’ve got my vote, to do all three sisters this year! Your costumes are amazing. You put so much creativity and work into them that I say yes, wear them again!!! Fabulous costumes! 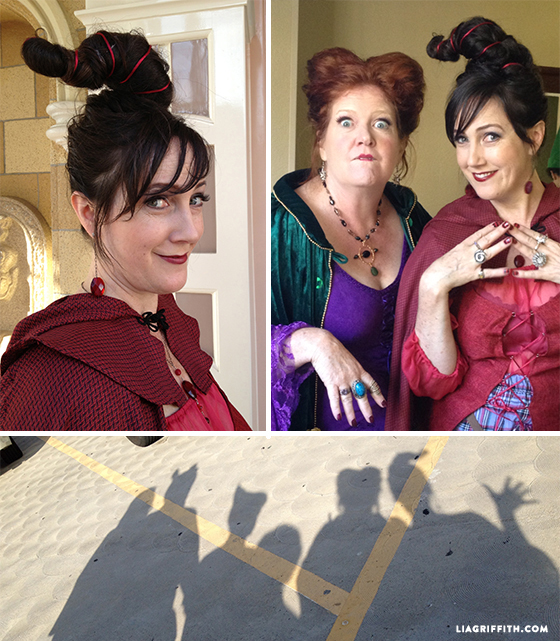 And I vote for adding your other sister to the Hocus Pocus fun next year….and post the pictures for us all to enjoy. Happy Halloween, Lia! Sounds like my third sister will have no choice;-) Cannot wait for next year! Lia, you rock! This is my all time favorite Halloween movie!!! If I was dressing up for Halloween this year, I was going to be Sarah. 🙂 Love love love your costumes. Hi Jenny, you should join us next year! The Hocus Pocus costumes bring back great memories. My children loved that movie. I’m going to pass idea along to them, and if they don’t do it I will. Thank you, for sharing all the wonderful ideas. You are welcome! Happy you like it, it is one of my favorite movies too. Cannot wait for next year! ha,ha,what a hoot you two are how wish I felt like dressing up & acting crazy having good time ,but I can look & laugh at people that do & I still enjoy it.Keep up work girls’ & be careful out there….